A lovely Spring like day working at Grosmont. Not many folk about (a couple of guys on an induction course, 2 or 3 couples walking round, and also 2 drunks later in the afternoon looking for a pub), one dead mouse in the trap near rear door and Paul Middleton in his office catching up with his paper work. After a cup of tea, with Trevor Wilford, Peter Ellis, and Alan Hardie, we first had to move the tender forward so we had enough room to start erecting the staging at its rear, it now being at the north end of Deviation Shed following the return of the Q6 from the running shed after its wash out. 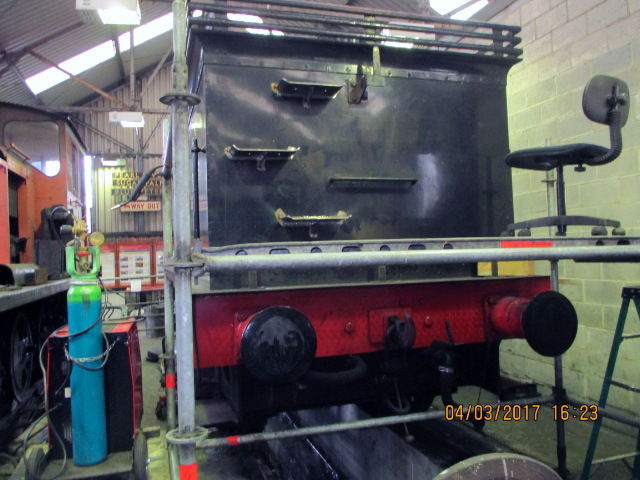 The Q6 itself is at the south end of the Shed, with the Weltrol containing No 29's boiler sandwiched between them. Alan was given the task of running the die nut down the dome threads, and managed to get 5 completed, in between helping with the taper pins and moving the loco about to get access to hammer the pins. Peter and Ian measured getting the tender area cleaned of paint ready for welding the new foot steps on the rear. Trevor was busy with the burner profiling the steps. Gordon Wells came to put in some cable for the new pit lights. He also made a tool for getting taper pins out, which worked well on the L/H trailing pin (now loose but not out). It was tried on the L/H intermediate taper pin but it was unsuccessful as the bottom of the pin was very weak and there was poor access - may have to resort to drilling again? The R/H Trailing taper pin has its bottom part cut off so this also may be a drill out job? These pins have been hammered on every fitness inspection by the duty fitters so it is perhaps no surprise that they won't move. After lunch, Trevor and Peter managed to get all three tender steps tack welded on. Trevor is hoping to bring Doug Blythe down on Wednesday to complete the welding. Failing this Trevor will complete the job next Saturday. In spite of the wash out there Is still a lot of scale round the foundation ring that needs removing. 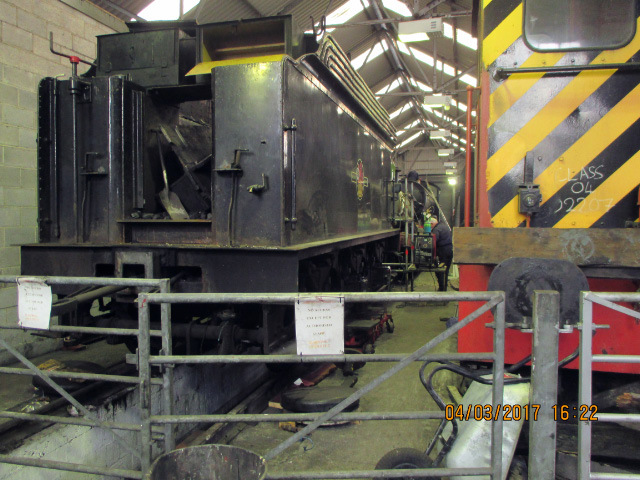 Paul Middleton is therefore planning to get the Q6 back down to the running shed on Monday for more washing out. Gordon and Ian also got a sample of 2" tube from between the flues onto the work bench and found evidence of pitting in various places. We may therefore have to sample other small tubes, but doubtless John Graham will have a look at this next week when he is down to inspect the boiler. The chimney was removed on Friday and this is now standing on a pallet in No 6 road.